SINGAPORE - Two workers cleaning the side of a Housing Board block were rescued by the Singapore Civil Defence Force (SCDF) on Monday (April 15) when their gondola tilted to one side - leaving them dangling six storeys above the ground. The two men had been working on the the facade of Block 451 Yishun Ring Road when the accident happened, leaving them stranded for around 15 minutes. It is believed that they managed to stay within the gondola. An SCDF spokesman said one of the workers was taken to Khoo Teck Puat Hospital with minor injuries, which The Straits Times understands includes cuts to the head, while the other was unhurt. A colleague of the two men, who are from India, said he heard a faulty motor had caused the gondola to tilt at around midday. The duo were trapped between the fifth and sixth floors of the block, and one worker was rescued using an aerial appliance. The other was rescued through the window of a sixth floor unit which the SCDF had to enter by force as no one was home. Full-time national serviceman Mr Rene Lee, 20, a resident of the unit, said the gate and door of his home were damaged, along with his bed frame and furniture. "The police called me around 12.30pm to say they had already entered the unit. As I was still in camp, my mother rushed home," he said. His mother, who only wanted to be known as Mrs Lee, 50, a sales director, said the experience was unsettling and had scared their dog. "Luckily nobody was badly injured. 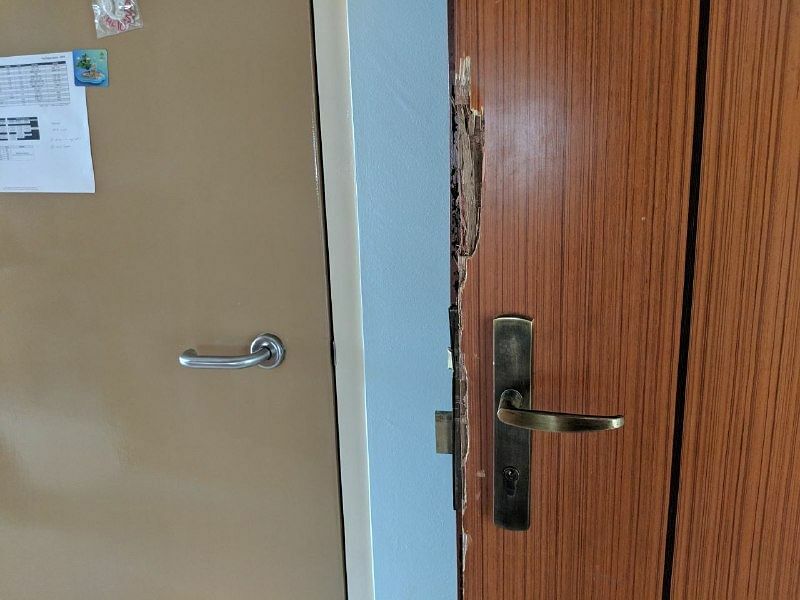 I just hope the door and gate can be repaired soon," she said, adding that Sembawang Town Council representatives visited to assess the damage. Residents saw several police and SCDF vehicles at the block during the drama, adding that cleaning and painting works had been taking place at the premises for several weeks. A spokesman for Sembawang Town Council said the workers were hired by a contractor, Choice Decor Co-operative Society, to carry out repair and redecoration works, and they had been washing the facade of the building to prepare it for repainting. She added that the contractor would ensure the injured worker makes a full recovery before returning to work. She added: "While the cause of this incident is under investigation by the Ministry of Manpower (MOM), we have instructed all works involving gondola to be stopped immediately until further notice."